Jordan is a country full of out of this world landscapes with ancient history right at your fingertips. You can spend days wandering around Petra taking photograph after photograph! 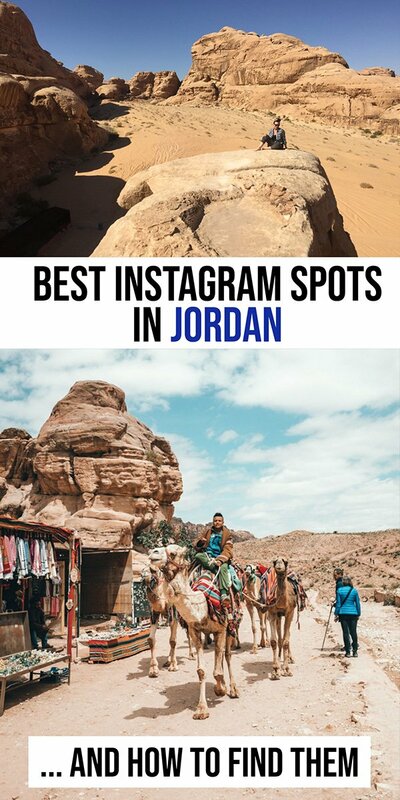 And not only Petra, the Mars like landscape of Wadi Rum, the ancient Citadel in Amman and the Roman ruins in Jerash all make for amazing instagram spots in Jordan. But these spots are not stumbled upon by accident, those who create amazing instagram photos are some of the best at framing shots. 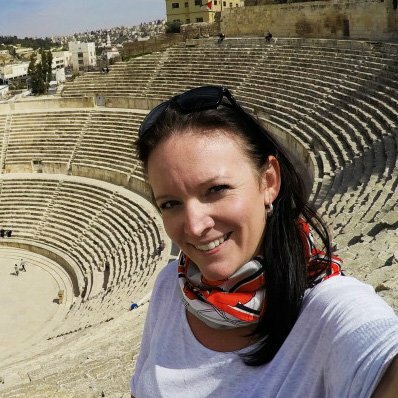 When you are planning your visit to Jordan, you will want to spend a few minutes reading this guide to the best instagram spots in Jordan so that you can fill your feed (and your memories) with lasting images of this country. There are so many beautiful spots in Jordan to take photos, but if you want to visit some of the popular photo spots in Jordan, keep reading for everything you need to know about getting to the best instagram spots in Jordan. Getting to Petra: Petra is a stop on almost every Jordan itinerary. It costs JD50 for a single day ticket or you can purchase the Jordan Pass and save yourself some money. Petra is about 3 hours by car from Amman. 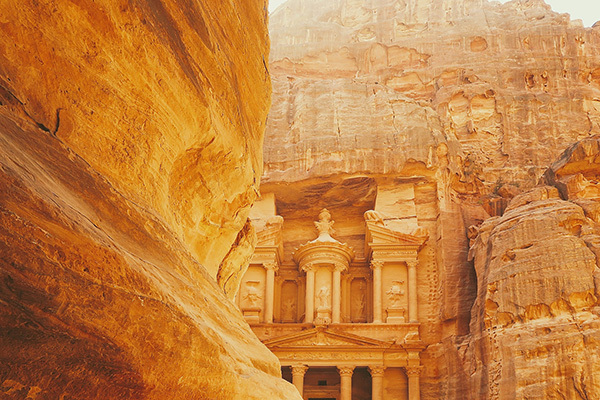 The treasury at Petra is probably the most photographed spot in Jordan, and once you visit it, you will know why. But not all instagram shots are created equal and if you want to get some of the best photos of the Treasury in Petra here are a few tips. To get to the ledge and take this shot it is quite easy. It is on the right hand side when you emerge from the Siq. Walk along the cliff walls until you come to it! Getting to The Petra Treasury: To get to the Treasury, you need to walk 2 km downhill from the visitors centre or you can take a carriage for JD30. While almost everyone visits the treasury, only a few attempt to visit the Monastery. It is beyond the basin in Petra and almost 4 km from the Petra visitors center, but offers stunning scenery, and no crowds! To get to the Monastery: From the trailhead it is about 45 mins to go up and is almost 800 steps. There are plenty of bedouins who will offer to take you up on a donkey if you do not wish to attempt it on your own. Some places find a way to stand the test of time and continue to inspire those who come across them. We endured some pretty brutal heat on the trek here, but arriving at the site without the crowds added to the mystique and memory. The sheer cliffs in Petra and the immense size of the Treasury make for epic instagram locations. They are not for the faint of heart! Just looking at some instagram photos in Petra is enough to get your heart racing. There is a safe way to get to the Treasury viewpoint in Petra and that is by walking Al-Khubta trail. To get to Al-Khubta Trail: After walking past the Treasury head downhill to the Royal Tombs. Climb to the tombs and turn left. There is a brown signs indicating Al-Khutba trail. Follow past the tombs and then you will make a right turn behind them and head up the mountain. It takes about 40 minutes for an average climber to acend to the top. You will continue to backtrack along the top of the mountain and eventually see the Treasury. You will have to walk back the way you came to get back down. Wadi Rum is instagram worthy from all angles! the backdrops of sand and mountains make for stunning photos. There are plenty of places to stop and take photos and there are plenty of examples of beautiful wadi rum photos on instagram. The Bedouins in Wadi Rum can show you beautiful landscapes, ancient Nabatean art and historical places such as Lawrence’s Spring. They can also show you traditional hospitality in a bedouin tea and how to tie a traditional scarf! Getting to Wadi Rum: Wadi Rum is about 4 hours by car from Amman or 1 hour by car from Aqaba. When you get to Wadi Rum, check in at the visitors center and you can take a Jeep tour. They are 2 hours or you can book 3 hours, half day or certain times of the day such as sunset etc. Oftentimes, you can also arrange this with your camp. Perhaps you want an early morning tour or something specific. Getting to Umm Frouth Bridge: If you want to visit Umm Frouth Bridge in Wadi Rum, you need to book a minimum 3 hour jeep tour, as it is not on the typical 2 hour tour. Atop Jebel Al-Qaia is what tourists call the Citadel. Its massive pillars are all that remain from Hercule’s temple and they make for amazing photos! Although right in the middle of the city, there are plenty of opportunities to get photos among the giant pillars with no one around. To Get to Amman Citadel: You can get to the Amman Citadel by car or by Taxi. When you get in the taxi ask for Jebel Al-Qaia if your driver does not recognize the word “citadel” (yes it happens). While already at the citadel you will find the restored Byzantine Church. The wooden roof and natural lighting makes it a beautiful spot for photos. While at the Citadel, you can find stunning panoramic of the limestone whitewashed buildings of Amman. Whether it is from the top of the hill of the Citadel or even from the parking lot, you can get a great photo. The lowest point on earth isa bucketlist worthy destination and it can also make for amazing instagram pictures. You can drive from Amman to the Dead Sea in less than an hour. Before you go here are some tips for the Dead Sea. It’s called The Dead Sea but I can’t think of a time I’ve ever felt more alive. Watching the sun dip into the horizon, floating above salt crystals and experiencing the feeling of being weightless. Wadi Mujib lies near the Dead Sea. Its sheer cliffs and beautiful waters make stunning photos. Note that Wadi Mujib is only open seasonally (usually starting April 1st but it depends on recent rainfall). Check out information on Mujib Biosphere Reserve here. How to Get there: It is best to drive to Wadi Mujib and you park at the Mujib Adventure center. Follow the signs to the Dead Sea. It is about 1 hour from Amman. Have you picked your favorite instagram spots in Jordan? Do you have any questions about visiting any of these places? Or any questions about Jordan in general? Let me know in the comments.